Why are Cheerios so popular? I've tasted all different kinds and they always taste bland and boring, yet they've been around for ages and are practically a breakfast staple. Maybe it's because I grew up in a Cheerio-less household? 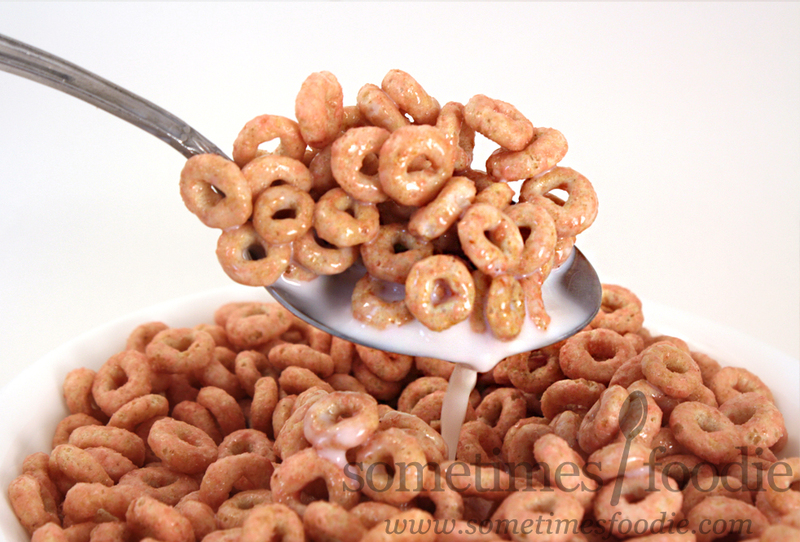 As someone who worked at a daycare facility, I always relate Cheerios to toddler-finger-food-fodder. (Sounds like a tongue twister!) They're the perfect food to sprinkle on a highchair tray so kids can practice feeding themselves, and they're easy to clean up. Are those qualities I really want in my grown-up adult breakfast? (Provided that I don't have any heart problems.) I, a self proclaimed Cheerio-hater, have decided to give this brand one last shot thanks to their newest flavor, Strawberry, and I really hope they convert me this time...because I had to buy a family sized box. We have a country-style wooden table with a white finish, lovely red berries and colorful dishware. When compared to other fruity flavored breakfast cereals, this has a more elegant look, so I feel like this design would appeal to an older audience, but strawberry-obsessed kids might gravitate towards this box as well. It's a lovely, simple, layout that takes fruity flavored cereals to a more mature place, and I really appreciate that. Inside, we have a plastic bag filled with pink-tinged Cheerio-O's, and they smell sweet and lightly fruity. It's not a POW in-your-face aroma like the citrus scent of Fruity Pebbles, but that makes sense with my history of mild Cheerios flavoring. It's a pleasant berry-like aroma, but nothing all that special. 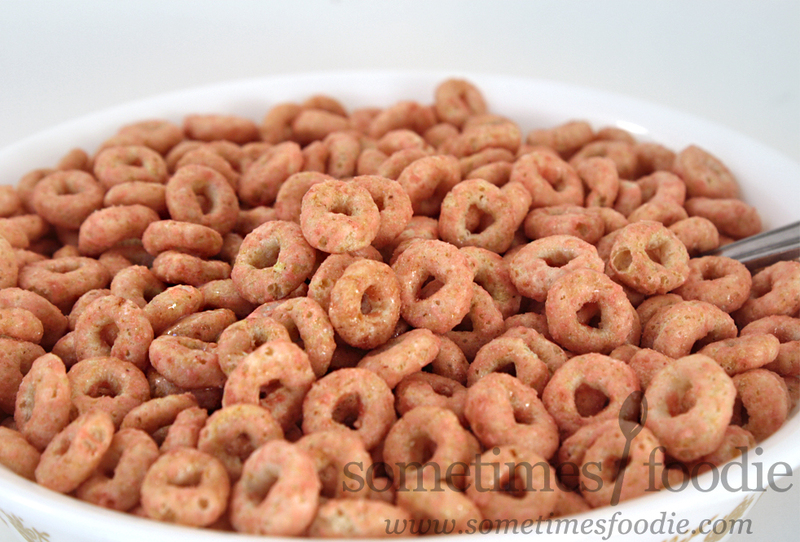 It's pretty much how you would expect a strawberry Cheerio to look and smell: sweet, mild, and kind of strawberry-like. Dry, and it's not bad at all! Easily the best Cheerio flavor I've ever tried. The texturing is light, and crisp, just like all the other Cheerio variations out there, but the glaze-like flavoring is sweet, tangy, fruity, and refreshing. I have to say, the tanginess really impressed me, because it makes it taste surprisingly authentic and beery-like! You know what? I like it! I really like it! This stuff is way better than Frankenberry and all those other chemical-heavy artificial strawberry cereals, but will this flavoring hold up in milk? With milk, eaten like typical breakfast cereal, the flavoring gets milder and less tangy, due to the milk washing some of it away, but it's still fairly flavorful and berry-like. I'd say it's still better and more realistically strawberry-like than Frankenberry, but I do miss the added tanginess that came from eating it dry. As it sits, the milk turns a light pink color and starts to taste strawberry-like, which is really nice, but overall, I prefer these right out of the box. These are the ONLY Cheerio flavor I like, and it's a pity that it's Limited Edition! 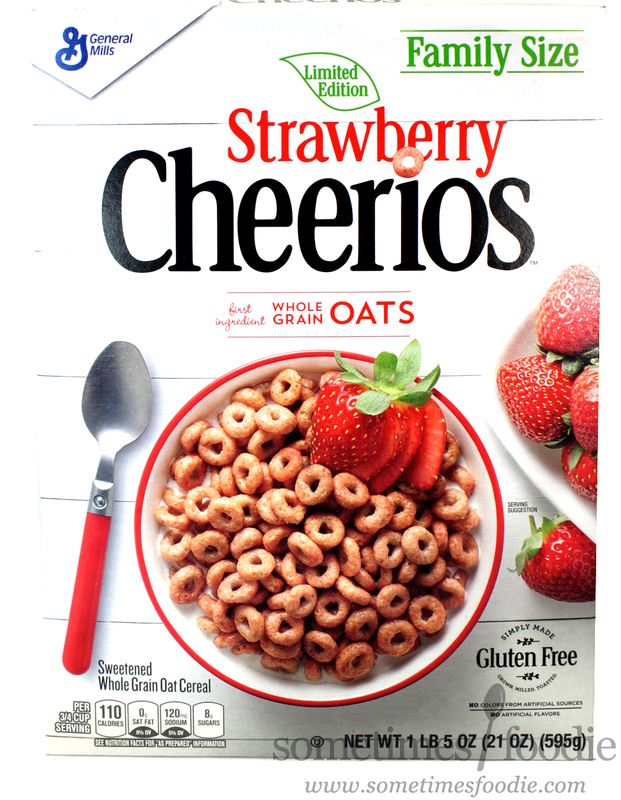 If you're a fan of fruity cereals and you've been longing for a more authentic strawberry cereal, this stuff is perfect! You can still grab these big boxes at Walmart, and I think a few grocery stores like Shop Rite are selling it in a "normal" sized box, but in the end, I'm happy I got this big box and I'd recommend stocking up on this one! It would be awesome if amped up with freeze dried strawberries in there! I bet they would be good in a rice krispy type treat! I wish this was a permanent Cheerios flavor!